This was, without question, the most important weekend of the season for the University of Maine winter sports teams. The Hockey East and America East seasons have officially wound down and now it’s time to fill the tournament steins as our heroes look to secure berths in their respective NCAA tournaments. As has been the case for the last couple of weekends, results were mixed across the fields of play and the level of heartbreak in Black Bear Nation all depends on to which team your strongest allegiance lay. Before we break open the Black Bear Nation FTS, we want to wish the best of luck to all the remaining winter sports teams in the respective conference tournaments. The great thing about college sports is no matter what adversity you’ve faced throughout the regular season, if you play great for one week in March, you can earn automatic entry into the NCAA tournament. We Fill The Steins to all the hockey and hoops players who represent “the college of our hearts always” as they begin their quest for NCAA glory!!! With that, let’s get to the Friday to Sunday round-up!!! Men’s Ice Hockey: Ah, yes, the curious case of the Maine hockey team. After putting themselves in position to control their own destiny and wrap up home ice advantage for the Hockey East tournament quarterfinals, the Black Bears now find themselves without even a first round bye after a pair of disappointing losses to Providence over the weekend at the Alfond. Friday night, the Bears found themselves trailing 2-0 30 seconds into the 2nd period and 4-1 with just over five minutes left in the game. Those deficits proved too much to overcome, as goals by Blaine Byron and Jon Swavely left the final tally at 4-2 in favor of the Friars. Maine never led on Saturday night, either, and ended up dropping the second game of the weekend series by a score of 3-2. Heading in to the weekend, Maine occupied the #3 seed in Hockey East, an honor with which Providence skated out of the Alfond after picking up four points against the Black Bears. With the two losses, Maine finished the regular season with records of 15-13-4 overall and 9-8-3 in Hockey East. Maine also fell to 6th in the conference and must host a first round, single-elimination game against #11 seed Merrimack on Saturday March 8 at 7pm. Maine’s prize if they win that contest? You guessed it…a best-of-three quarterfinal series with the Friars, a series in which Providence will have home ice advantage. We’ll have much more on Maine’s crushing defeats at home to Providence and a preview of their win-or-go-home tilt against Merrimack on episode #3 of the Fill The Steins Podcast, which you can listen to live on Sunday at 7pm ET!!! Women’s Ice Hockey: The women’s hockey team saw their season come to a close in one of the most painful ways possible…a triple overtime road loss at Vermont in the single-elimination quarterfinals of the Hockey East tournament. After trailing 2-0 for the majority of game, Maine pulled even after a pair of 3rd period goals by Emilie Brigham and Hailey Browne. From the point where Maine tied the game, the Black Bears and the Catamounts played the equivalent of an entire other contest, one which finally ended when Vermont’s Brittany Zuback found the back of the net against Maine goalie Meghann Treacy with 2:48 left in the 3rd overtime. That goal ended both the game and the Black Bears’ season. With that final, crushing, season-ending defeat, Maine wrapped up the 2013-14 campaign with a record of 7-21-5. Their effort on Saturday, however, was one far superior to what that record would indicate, and we Fill The Steins to UMaine Women’s Hockey team on their hard work and never-say-die attitude to the bitter end. Cheers, ladies! Women’s Basketball: Things are much brighter on the hardcourt for the women’s hoops team. After taking UMass-Lowell DOWNTOWN TO POUND TOWN on Senior Night Wednesday at the Cross Center, the lady Black Bears followed that up with a regular season-ending road win against rival UNH by a final score of 66-62. Ashleigh Roberts continued her recent run of impressive play Saturday in Durham, as she led the Black Bears with 17 points and 9 rebounds. The win pushed Maine’s final record to 16-13 overall and 10-6 in America East, an incredible turnaround from a year ago for Coach Barron’s squad. It also locked up the #4 seed in the upcoming America East conference tournament for the Black Bears. Maine will now look to win the aforementioned America East tournament and gain automatic qualification for the NCAA women’s basketball tournament. That journey begins on Friday March 7 at 8pm, when the ladies travel to Albany for a neutral-site quarterfinal matchup against the #5 seed Hartford Hawks. The Black Bears and Hawks exchanged road wins against one another this season, which should set up for a real barnburner in Friday’s single-elimination contest. Men’s Basketball: The Maine men capped off what can only be described as a frustrating, disappointing regular season with a come-from-behind 73-69 win against UNH at the Cross Center in Bangor on Sunday. After trailing by double digits at halftime, Maine outscored the Wildcats 38-24 in the 2nd half to end a six game losing streak and finish the regular season 6-22 overall and 4-12 in America East. The win, which was led by Till Gloger’s 15 points and 14 rebounds, also moved Maine out of the America East basement (swapping spots with UNH) and into the #7 seed for the conference tournament. Maine will take on #2 seed Stony Brook in the America East quarterfinals Saturday March 8 in Albany. As with the women’s tournament, it’s a win-or-go-home format, so Maine will need to play its best game of the year to upset the 21-9 Seawolves. 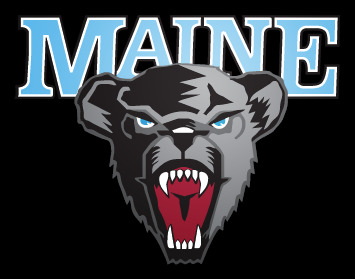 Despite Sunday’s win and regardless of the outcome of the America East tournament (barring a near-miracle tournament championship for the Bears), Fill The Steins is still of the opinion that it’s time for Ted Woodward to step down as coach of the Maine men’s team. This is a position we reiterated in Monday’s Bangor Daily News. Check it out and give us your feedback in the comments section below. Remember to join Adam and Brian for the Fill The Steins Podcast LIVE at 7pm Sunday night (and anytime throughout the week, via our archives). In addition to our official preview of the Hockey East tournament, the boys will also be joined by UMaine alum and Washington, DC’s WNEW anchor and reporter Jim MacKay. Jim will be reminiscing about his time at UMaine and WMEB, discusssing what it’s like to cover the news in our nation’s capital, and telling Adam and Brian how awesome he thinks Fill The Steins is. Don’t miss it!!! Not only that, but Fill The Steins will also be previewing the men’s hockey and men’s & women’s hoops first round tournament match-ups throughout the week here on the site. So check back throughout the week as we fill the steins with knowledge, prognostication, and predicitions to get you ready for Hockey East and America East tournament play!! !